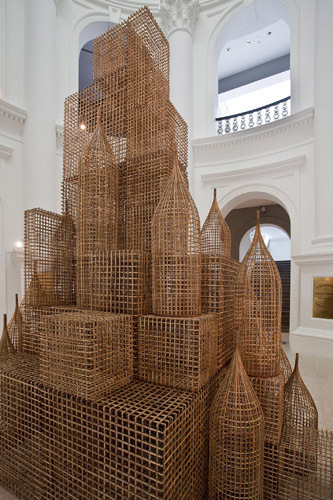 Sopheap Pich, Compound (detail), 2011, bamboo, rattan, plywood, metal wire, dimensions variable. The declared nontheme of this year’s Singapore Biennale is “Open House,” which alludes to Asian festivals such as Dewali and Chinese New Year, a time when people open their homes to one another. In this respect, visitors are invited to experience contemporary art in terms of the everyday. But in view of 2010’s seemingly universally lauded Gwangju Biennale, which explored the contemporary, global status of the image, questions of the possibilities of what a large curated show can do hang heavy over such an open-ended approach. On the other hand, to resist or refuse a tighter theme merely brings us back to the individual experience of artworks. But such a refusal does allow us to determine interest for ourselves. There is the patently brilliant: Sopheap Pich’s jarring structure of rattan in the classical rotunda of the National Museum; Phil Collins’s beguiling film of young male Malaysian skinheads; Ryan Trecartin’s compelling video installation of suburban Americana weirdness; and Michael Lee’s fascinating invention of the work of an impossible architect. Then there is the noteworthy in terms of the context—Danh Vo’s devotional gilding of cardboard and Mike Nelson’s wrecked white plinths in the ghost town of Singapore’s old airport—and the noteworthy per se: Kyungah Ham’s embroideries of politically sensitive images that were commissioned and smuggled from North Korea. Finally, the surprise discoveries and artists to watch are Ruben Ramos Balsa, who contributes lyrical projections on domestic furniture, and Gigi Scaria, with his continued dedication to the anonymity produced by urbanization. This biennial encourages a close engagement with the individual artworks, and therefore I conclude by citing a comment from from the accompanying literature: We should ask what biennials demand of us rather than what we want from biennials. However, such a claim does sidestep critical issues of why these large-scale shows are needed and what they can possibly achieve.